The Delaware Valley is getting rather close to peak autumn color -- we will likely see "peak" happen most everywhere over the next five to seven days. The combination of sunshine and crisp nights, in addition to the increasing length of night, will help add additional color...and eventually that "lovely" shade of brown as the leaves fall to the ground in the coming days. 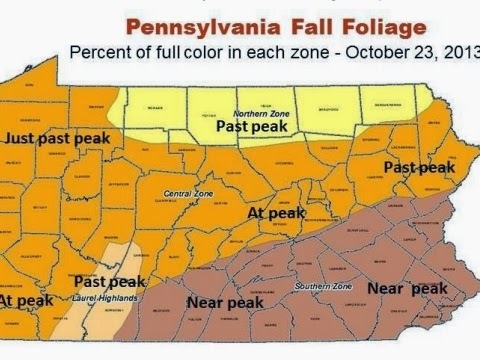 At peak and past peak fall color is occurring farther to our west and northwest -- above Blue Mountain and into the Poconos, where fall color peaked over the past few days. 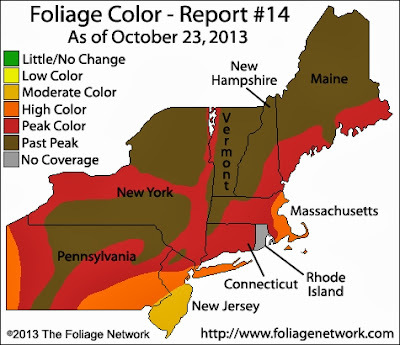 If you head to Blue Mountain or across Berks County, vibrant color is common this weekend not too far away from us. In New Jersey, autumn color is near peak across the northwest part of the state. Central and South Jersey still have some time to go before peak is reached. We're not too far away from "norm" in this department as our climatological peak for autumn color is around the end of October locally. With a relatively nice but breezy weekend ahead, it will make for a good opportunity to head not too far away and experience some autumn color as peak conditions aren't too far away!